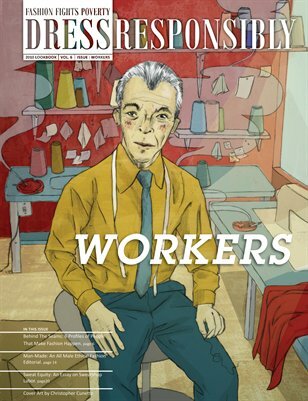 The “Worker” issue celebrates the people who toil, as our lead essay suggests, “Behind The Seams.” Our staff writers profiled a seamstress, a pattern maker, a milliner, a cobbler, a textile designer, and a design educator, describing each person’s background and their craft. Foreign Policy Digest writer Mahanth Joishy discusses the darker side of the fashion industry in “Sweat Equity,” a piece on child sweatshop labor in South Asia that is beautifully illustrated by artist Christopher Cunetto. Peruse our program summary to see how FFP is working with Kiva around the world to provide micro-loans and opportunities to artisans in Uganda, Praguay and Peru. “ManMade” is our first ever all-male ethical fashion editorial photographed by Michael Dumlao and featuring the styling of Will Lawry, the fashion designs of Bill Johnson, and words on bespoke style by Patrick Peterson. “Artisan Style” by Shannon Kielty and photographed by Sara Kerens outlines ways to incorporate handicrafts into one’s wardrobe.